One-Write Checks, Pegboard Checks, One-Write pegboard Checks. If you are currently using a one-write check of any of the one-write pegboard check systems shown above, check with us first! We carry compatible replacement one-write checks and forms just as good as the originals, and often at a much better price. Whether you call them one-write checks, pegboard checks, or one-write pegboard checks and forms we probably have it. From one-write checks, one-write statements, one-write receipts, one-write journals, or one-write ledger cards, we have a selection of over 3000 available. We also carry a supply of one-write pegboard healthcare day sheets, visit slips, superbills, and other medical forms. One-write check systems cut your bookkeeping time by up to 75%! Why write it four times when you can write it once? 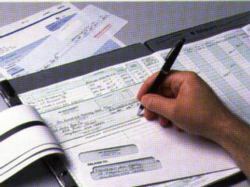 As you write your check, the carbon strip on the back of the check transfers the information onto the journal in the proper columns, thus eliminating the need for check stubs and double posting. When you are finished writing all of your checks, your posting work is also completed....checks are written and the journal is posted - All at the same time....all in one writing. Due to the design of the one-write check, it can be inserted into a double window envelope, thereby eliminating one more step - Addressing the envelope. Checks, Journals, Ledger, Envelope....All In One Writing! Our one-write pegboard systems come in a variety of business applications! Give us a call us for help when ordering.